The guitar had always struggled to be heard when played alongside fiddles, banjos, mandolins; and basically any other instrument. One could not easily use a plectrum to play loud enough to be heard in mixed company of instruments. So the guitar had mostly always been a rhythmic instrument. You used the guitar to strum chords behind a singer or a soloist. This was all well and good, but the guitar had such amazing potential as a lead instrument. Across the ocean in France Django Reinhardt was blazing away on a steel string acoustic guitar, trading solos with a violinist. So here in America the hunt for greater volume from a steel string acoustic guitar was on. First, C.F. Martin & Company increased the scale length on their orchestra model guitars, causing them to become louder as the tension on the strings were increased. Then, the dreadnought, a larger body than previously seen, was used. It wasn't long before there were jumbo guitars, larger than even the dreadnought; and still there was a desire for more volume. During the 1920s the lives of everyone living in the industrialized world changed. For the better. Residential electricity was becoming widespread and normal, even for the poorer persons. Now you could have bright lights indoors at any time of day. You could listen to music on either of two newfangled devices, radios or phonograph machines. There was even a machine which allowed persons to talk to someone very far away - their voices somehow transmitted through copper wires. Solid body electric guitars were decades from being produced. But by the late 1920s some of the finest builders of acoustic instruments, persons such as Lloyd Loar, were already dabbling with ideas for amplifying acoustic guitars. A patent was filed for in 1924 for an electric violin. But it was the guitar which was becoming ever the more popular. Microphones had already become common enough, and so it was regularly seen that the guitarist would play into a microphone for amplification. In 1928 Stromberg produced the first electrified guitar product; but the incipient guitar pickups were not quite developed enough. Why buy a rosewood body acoustic/electric dreadnought guitar? Skip forward to the year 2016 and electronics for acoustic guitars are simply outstanding. The dreadnought has long been the single most popular body style for acoustic steel string guitars, and rosewood its most preferred tonewood. Why is rosewood so popular? Well, it is a beautiful wood to look at, but the aesthetic stretches beyond the physical into the tonal realm. It produces a deep, dark, sophisticated, overtone laden tonality many persons are drawn to. Rosewood costs more than some other equally good woods used for guitar bodies. And to make matters harder, rosewood is stubborn when it comes to shaping it into a guitar body. It takes more man hours to shape rosewood into a guitar. So rosewood body acoustic guitars were always more expensive than maple or mahogany bodied guitars. They still are more expensive. But nothing sounds like rosewood but rosewood. 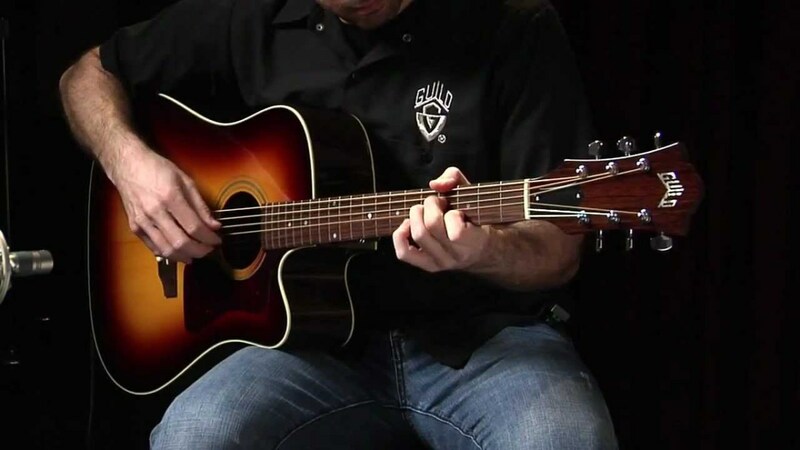 A dreadnought body with solid rosewood back and sides, and most often, a solid spruce top - such a guitar is loud enough for the person who plays alone, or with a small group of friends. This is true except when the group of friends include someone on mandolin, violin or fiddle, and then a banjo. In such a situation an acoustic/electric with amplification would often be needed. And if the ensemble plays live, you absolutely need your acoustic guitar amplified. So here are five of the best rosewood body acoustic/electric dreadnoughts for the performing musician. I'm seeing these guitars on sale for fifteen hundred dollars. That would be a great price even were these guitars without the electronics. This is a solid east Indian rosewood body Martin with a solid Sitka spruce top. Essentially, this is a D-28 without the additional abalone herringbone inlay. A stripped down D-28 with a cutaway and Fishman electronics is what we have here. The Martin Custom Performer DCPA4 Rosewood Dreadnought ought to be here to stay as a production instrument. But you can expect the price to rise. While this guitar can get the job done regardless of what style of music you play, this thing would be a bluegrass cannon. The rosewood and spruce Martin Ds are legendary for the deep bass response you need to snap off those G runs. But for the rocker playing an unplugged show, the power chords couldn't possibly sound better than what this guitar could do. Another of the reasons this guitar can sell for so little is its incorporation of a new material in guitar building. The fretboard and bridge are of durable Black Richlite. Gibson guitars are also incorporating this new, very dense material for some fingerboards and bridges. The Taylor 810 line of guitars were built for one purpose - to compete directly against the Martin D-28 and the Gibson J-45. All are rosewood and spruce dreadnoughts. None of the three sound like either of the others. Such is the greatness of America's guitar builders. They can use the same ingredients and shapes and come up with outstanding guitars with completely different characters. The c and the e, obviously, in this example stand for cutaway and electric, respectively. This is a fancier guitar than the Martin above. This guitar would correlate or compete directly against a Martin D-28ce, but you'll be hard pressed to find one of those. They are not standard production for Martin. 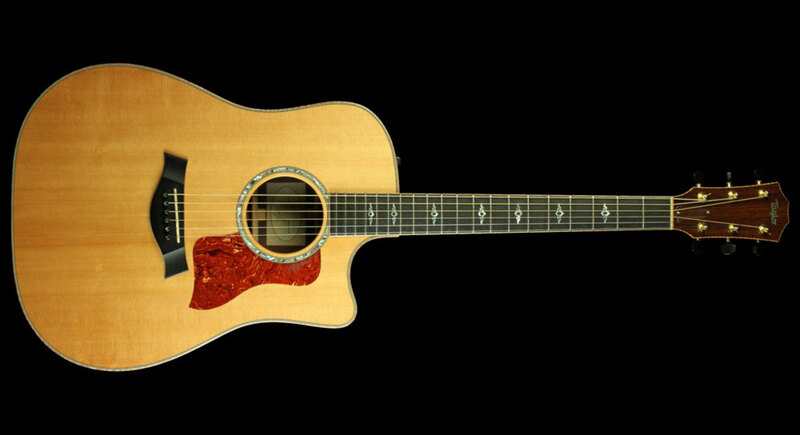 The Taylor 810ce dreadnought acoustic/electric guitar, however, is a standard production instrument for Taylor guitars. From the very beginning Taylor was going in a different direction from the crowd. Taylor guitars were, as a company, going for sales in acoustic/electric when the competition was not. So as it is now, Taylor has its own system of acoustic/electric electronics, while almost everyone else uses Fishman electronics. The Taylor Expression System is their electronics system on their acoustic/electric guitars. There are a number of great videos available about the Taylor Expression System, and I've provided one here. Taylor doesn't stick to old things, as a rule, they are constantly attempting to improve their guitars and the electronics on them. So an older Taylor 810ce may not be exactly like a newer one. Taylor has changed the internal bracing of their acoustic guitars, and updated their Expression System as time has marched on. This Taylor 810ce goes for around $3,500 bucks. 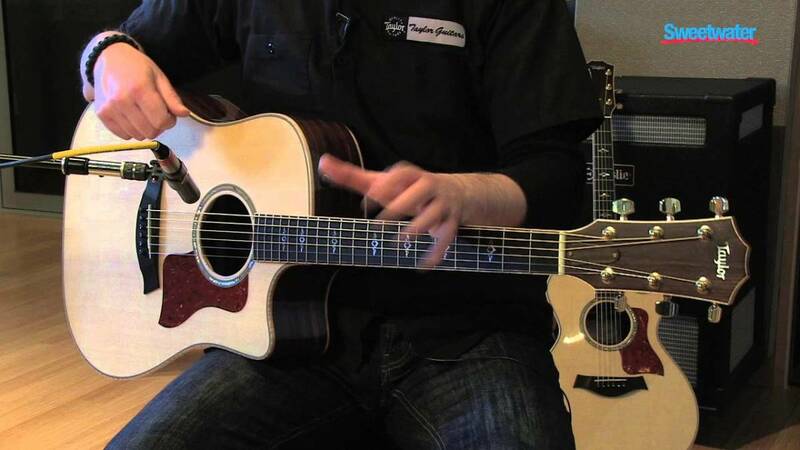 As already stated, the Taylor 810 was built to compete against the Martin HD-28. But insofar as sound and play-ability go, it can be compared directly to the Martin above. An HD-28ce would be nearly impossible to find. In no way would I ever say one was better than the other. I've been lusting after a Taylor 810 for many, many years. I've played many of them at guitar stores and music festivals. Some people find the Taylor guitar necks much more comfortable than a Martin neck. You simply have to try as many guitars as possible before unloading your hard earned pay for one. Keep in mind the Taylor 810 without the cutaway and the electronics is a significantly less expensive guitar. 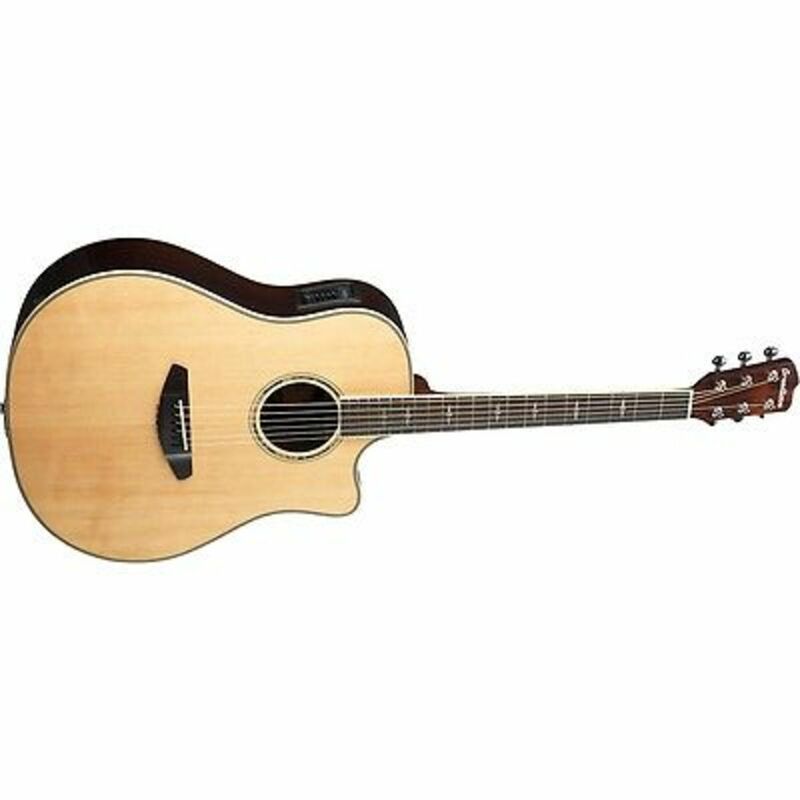 But for those wanting the legendary tonal combination of rosewood and spruce, and in an acoustic/electric dreadnought, you can't go wrong with a Taylor 810ce. It's a true professional's guitar, and able to shine regardless of what style of music you play. My purposes here with this article, and all guitar articles is straight talk. I'm giving it to you straight as I believe things to be. The Guild D-50ce is every bit as great a guitar as the Taylor 810ce, and a fancier guitar (as too is the Taylor) than the Martin up top. Thing is, the Guild D-50ce will be much more difficult to find. Unless you know of a store where Guild is a heavy part of their inventory, this made in the USA Guild D-50ce won't be so easy to come by. But this Guild is built to compete. And compete it does, and then some. Some people will tell you the Guild sounds better than a Martin HD-28, and those people aren't lying to you. They are giving you a valid, very valid, opinion on the matter. The Guild D-50 guitars are not HD-28 copies. Guild guitars have their own character. They are not attempting to be like Taylor guitars in any sort of fashion either. Ren Ferguson runs Guild Guitars, and he runs a very tight, high quality ship. Guild made in the USA guitars are exceptional instruments. They hold their water against Martin, Taylor, Gibson, and the rest of the pack too. 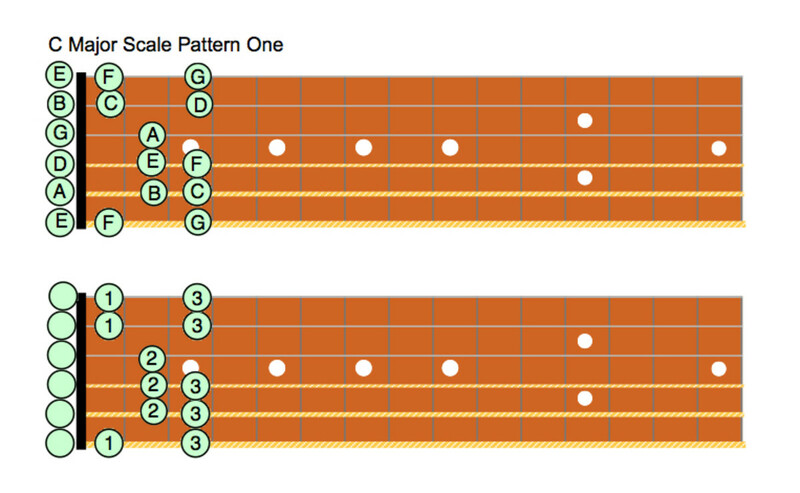 Thing is, you are much more likely to run into a Guild D-150ce than a Guild D-50ce. What is the difference? Insofar as price is concerned, there is a huge difference. The '1' in front denotes the guitar was built in China somewhere. And it won't be of the same scrupulous build quality as a Guild made in the USA. Now that all of the above has been said, you can get a Guild D-50ce on amazon.com. You can also get a Guild D-50ce in sunburst at the same location. I'm pricing these guitars, the American made ones - at between two thousand dollars and thirty five hundred dollars. The more expensive ones are more expensive for having either a red spruce top, or a Madagascar spruce body. Another thing to be aware of with a used Guild D-50 guitar is the finish. When Guild closed one of the factories down, and relocated to California, they started to get a bad reputation for their acoustic flat tops, as they has poor clear coat finishes. They got weathered looking way too fast. But these problems have been ironed out, and do not apply to new USA made Guild guitars. The Gibson J-45 has always been the unpretentious workhorse guitar. It isn't nearly as fancy as a Gibson Hummingbird or Gibson Dove, and nowhere nearly so expensive as the big J-200. The Gibson J-45 has always been meant to be much more affordable for the working musician to own and use. So the Gibson J-45 has also almost always been a mahogany body guitar. Something which competed against the Martin D-18. But rosewood body J-45s have always been an option. So to be clear here. Almost every J-45 you ever will see will be a mahogany body guitar. But rosewood bodied J-45s aren't something new. They've been a option for J-45s for a long time. 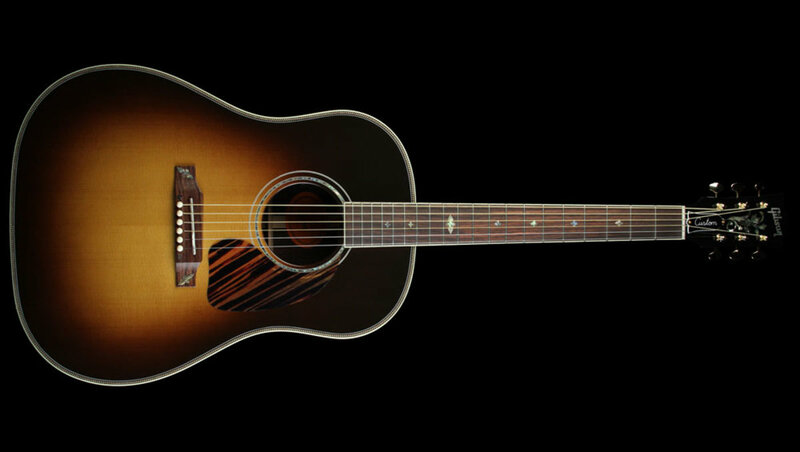 But this specific guitar is the Gibson Limited Edition J-45 Custom Mystic Rosewood Acoustic/Electric Vintage Sunburst. Another thing which needs saying is that almost all J-45s regardless of their tonewoods in the back and sides, are sunburst guitars. Almost all. You can get a J-45 with a natural finish. But you won't be seeing a lot of those. This guitar is an acoustic/electric. Gibson dreadnoughts are noticeably shaped differently from Martin dreadnoughts. They are described as 'slope shouldered' dreds. And they are voiced very differently from Martin style guitars too. People tend to prefer Gibson dreadnoughts for use in acoustic blues music. But there's no reason one can't be used for any style of music. Especially this one. Why? Gibson acoustics are usually not as loud as Martin, but this is an acoustic/electric. So plugged in the guitar will be as loud as you wish for it to be. If you've never tried out a Breedlove guitar, then I recommend you do so. And I recommend you try this one. For the price they are asking for this, it is the pick of the litter. This guitar is selling for just under one thousand dollars. This is an all solid wood construction Breedlove with east Indian rosewood back and sides and a Sitka spruce top. It's highly irregular to find guitars this good selling for this little. And this is an acoustic electric guitar with a cutaway too. For the young or otherwise less affluent, or for the very money smart and thrifty musicians, this Breedlove is the place to be. 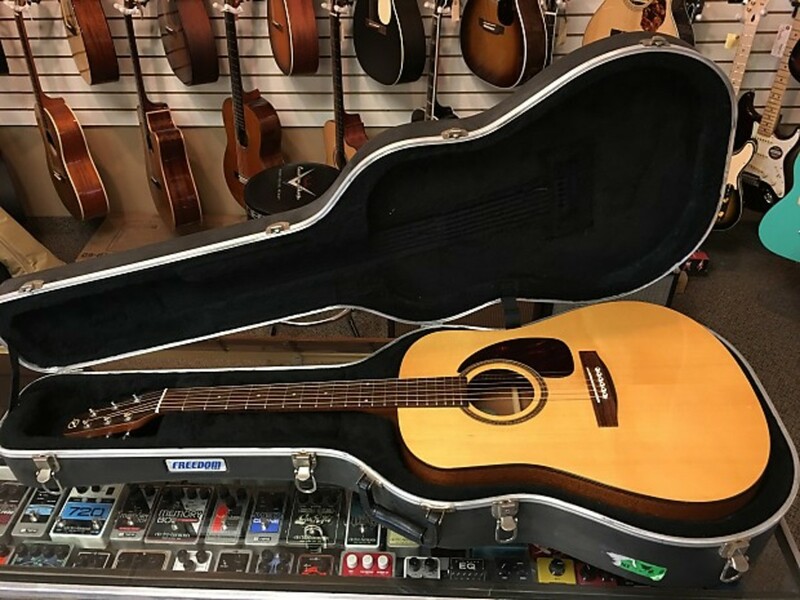 This Breedlove 2015 Sitka Spruce Top Stage Dreadnought Acoustic-Electric Guitar, were it played or demoed next to the Martin up top may prove more favorable to the player. I've always been very impressed with the Breedlove guitars I've had the good fortune to lay hands on. One of the reasons this guitar sells for just $899.00 is because it doesn't come with a hard shell case. Well, you can always pick up a used dreadnought case sometime later. This guitar, as does the Gibson, features L.R. Baggs electronics. These are very good electronics, but they (of course) differ from those used by Martin and Taylor. Dave, I will happily play a Stonebridge guitar just as soon as I see one. I'm always glad to see something I've never seen before. Try a Stonebridge at a fraction of the price.